I'm fascinated with trends and the influences on color and design, and how they differ based on regional interpretations. 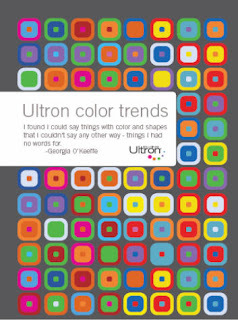 Imagine, then, how intrigued I was when I learned that Ultron carpet fiber was bringing together designers in a first-ever series of four workshops to discuss color trends. The events took place in the evening so no daily work obligations would interfere. Each event started out with Ann sharing and discussing three design boards she had put together to set the stage for discussion. These boards [see photo left] represented the influences and captured the process that Ann goes through as she puts together a color forecast. Her sources of inspiration include global trends from the trade shows she attends [NeoCon, Heimtextil, and Maison et Objet], influences from Italy and Berlin (Bauhaus), photos from CMG and CAUS workshops and nature. Next, workshop participants each had 5 to 10 minutes to introduce themselves, their firms, their specialities as well as show and discuss what they had brought - their inspiring colors and samples. And then the group discussed what each had brought, examining similarities and / or differences..... and thinking about international trends, regional trends, historical trends, and color trends for 2009 as well as "star gazing" for 2010 and beyond. Afterwards Ann disassembled and reassembled the boards into color families by city. Ann considered herself both facilitator or anthropologist for the events, recording and organizing thoughts and comments. This episode of A Foot's Perspective is about a Wow! carpet style that I came across at the Mirage Hotel in Las Vegas, NV where I stayed for the yearly Surfaces flooring trade show. In the previous episode of A Foot's Perspective, I showed you the carpet inside my room at the Mirage. This time, I take you outside into the hallway of the 22nd floor! From the photos you get a feel for the animal print and nature inspired patterns and colors - which echoes the theme of the Mirage hotel itself. The circular motif carpet pattern is what greets you as you step outside of the elevator bank. The pattern morphs from giraffe and leopard/cheetah patterns to butterfly or moth-like spots. Note the brown border surrounding this central focal point. From there, three separate hallways - like spokes on a wheel - go off toward the guest rooms. The hallway carpet pattern builds off of the central motif, but introduces tree branch motifs, in two alternating patterns: one stretched out vertically; the other, horizontal and bordered in red indicating guest room door entries. In this video, I start out by the guest room section of the hallway where the tree branch and bark qualities are strongest. The flow toward animal inspired patterns works smoothly and naturally; it's also visually intriguing. Note how color is used to indicate direction and destination. It works hand-in-hand with the pattern changes. It creates rhythm and flow - as you might in your own home. See for yourself in this episode of A Foot's Perspective! How might you apply some of these ideas to your home? For the most recent episode, visit A Foot's Perspective - Episode 21: Wow! Mirage Carpet. I'm back from Surfaces 2009 and thought you might enjoy some carpet style trend info from the show. Let me confess to you up front. Given the big news [Mohawk Purchases Wear-Dated Brand], I didn't get a chance to wander as I had hoped, camera in hand, absorbing flooring influences. However, I do have friends in excellent places who were able to do so - namely, Shannon Bilby who blogs at the WFCA's Floor Talk! Shannon has written up a wonderful series of posts discussing what she observed at Surfaces across flooring categories - carpet, area rugs, tile and hardwood. As it relates to carpet and area rugs, before referring you to those posts, I thought I would summarize her observations. First, she says that "area rugs this year are all about texture." Texture from thick yarns as well as from "felt discs and sculpted carpets." She refers to "linear striations, large oversized patterns as well as smaller scale more traditional patterns", color schemes ranging from soft shades to rich oranges, greens, greys and blues. 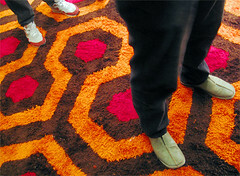 For the full post, see Trends in Area Rugs - Surfaces 2009. What struck Shannon most on the carpet side was a renewed emphasis on quality of product rather than quantity. That's something I've heard discussed quite a bit [most recently it came up in Consumer Choices And The Retail Experience] both at Surfaces and beyond: quality matters again. Although neutrals reigned in product displays, she saw a wealth of delicious colors: oranges, greens, blues, grays and earthy shades of brown. Shannon says: "the oranges and blues were muted and rich. The greens were light and lively. The browns were earthy, coffee inspired and looked like great candidates for hiding traffic!.. and beautiful heathered products that have more range of color than I think we are all used to seeing in once piece of carpet." Gridlock, Metro Oasis and --- [I will get them properly identified]. The fourth pattern in the booth was Urban Links [see Greer's Carpet Fashion Underfoot: Urban Links Carpet Style]. Shannon reminds and urges you in her post to be sure to feel the carpet styles as they are delicious under hand and foot! For her full post on carpet, please read Trends in Carpet - Surfaces 2009. As it relates to color, I was able to attend Mark Woodman's presentation titled "Seek, Experience, Inspire" during which he urged us to seek inspiration from everywhere - be it the color of a Brazilian drink influencing what color to launch the new Saab 903 to unexpected textures and cultural combinations. He stated that "Color will take on more importance as an easy way to update a space, product or home.... The economy is key but consumers still want excitement with their value." I'll capture some of his color observations in a separate post. HipMama.com recently posted aaaahhhh! about acrylic paint. More specifically: "Does anyone know how to get black acrylic paint off of a carpet, or am I screwed? It says it's a "stainmaster" carpet...but when I tried to clean it up, it made a smeary mess so i stopped... Anyone have any advice?" What a perfect subject for this episode of Annette's Carpet Corner! As with all stains, it's best to deal with the stain as quickly as possible. + Remove as much of the paint itself as possible by blotting with a white paper towel or scraping with a dull knife. + Apply isopropyl rubbing alcohol to a clean white cloth, white paper towel or cotton ball. If the spot extends deep into the pile, blot until it is removed or no color transfers to the cloth. Do not allow the alcohol to penetrate the backing, as it will destroy the latex bond. If the spot is on the surface only, rub in one direction at a time.If rubbing removes the spot, blot dry and stack several white paper towels over the damp area. + Place a brick or similarly weighted object on the towels to keep them in contact with the carpet. The towels will absorb any stain wicking up from the backing to the carpet surface. + Allow the carpet to dry, remove the brick and towels, and brush up the pile. Please remember never use a circular motion to remove a carpet spot as this may destroy the texture! + That you might want to pretest any spot removal solution (for color transfer to the cloth or damage to the carpet) in an inconspicuous area. If a change occurs, select another solution [Spot Solver offers several stain removal solutions]. + Don't rub, but do work from the outer edges of the spill to the center to prevent spreading. Be patient. Blot. + Consider calling a Professional Cleaner who will have the ability and equipment to apply more aggressive cleaning solutions to remove stubborn stains. Annette also located this resource aptly titled How To Remove Paint From Carpet. Acrylic paint is water soluble when wet, but not when dry. The author suggests mixing some laundry detergent [Annette suggests 1/4 teaspoon of hand dish washing detergent like Dawn or Joy mixed with 1 quart of water]. What I've learned from all this is that it's best to avoid paint on carpet at all costs. If unavoidable, act as quickly as possible. If you don't notice the paint stain until it's too late, it's probably best to call a professional. However, should you want to tackle removing acrylic paint from carpet, you have options to explore. If you're reading this blog post, there's a very good chance you're in the market for carpet. Maybe you're ready to buy carpet? Or simply searching for information about carpet. We'd like to help. According to a 10/15/2008 MediaPost article titled Karastan: Building Share Of Voice In A Recession, "every time a consumer shops for flooring, it's like the first time. Even if they've made a significant flooring purchase in the last five years, they need to learn about it all over again. And the place they want to do that is on the Web." Not surprising -- the web is where I turn to for information. Is it the same for you? But it's also daunting as flooring and carpet aren't always the easiest to connect with online or offline. Happy Exploring! If you have questions, please let me know. This episode of A Foot's Perspective is about another Wow! carpet style that I came across at the Mirage Hotel in Las Vegas, NV. That's where I stayed last week for the yearly Surfaces flooring trade show. This was my first visit to the Mirage and I really enjoyed my room. The style: definitely modern! And, really fun! From the photo, you can see that the lines are clean and straightforward, almost sparse. If it weren't for the splash of orange accents, and the bold carpet pattern, the room might have seemed oppressive or uninspiring. I can assure you that that wasn't the case! The room was a haven from the gaudiness of the casino scene and the hectic pace of Surfaces. It helped me recalibrate and rebalance. The carpet, as you can see, features a large, contemporary circular pattern in chocolate brown and light-cafe-latte [i.e., a shade of beige]. I love that the color contrast is so stark and yet the textural contrast so subtle between loop and texture carpet construction styles. The orange accents pop and that bolster pillow is preposterous! What do you think? Would you try something like this at home? For the most recent episode, visit A Foot's Perspective - Episode 21: Wow! Dallas Carpet. Or you can scroll through previous blogposts with links to all previous episodes of A Foot's Perspective. February's Design Reviews From The Floor Up introduces you to 2Modern Design Talk, the design blog for the 2Modern retail site. 2Modern Design Talk is filled with delightful inspiration. Originally launched in August 2005, the site now features the perspectives of 18 contributors all involved in varying aspects of modern design - from different parts of the world [Chile, Brazil, Australia and the United States], a range of designing angles [graphic, object, furniture, showroom, industrial....] and interests [trend spotter, buyer, artist, painter, writer, crafter...]. The end result is a rich site featuring a "wide-range of views and commentary focused on contemporary design" as About 2Modern Design Talk explains. It's also very approachable and visually inspiring with delicious photos about modern design topics of interest to us all. Take Sushi Artwork. Or lighting fixtures from the 2009 Interior Design Show in Toronto. What about Biomorphism and Solar Design and Wallpaper From the 70's? Or amazing Big scarves for this season. Check out New Rugs from 2Modern & Emma Gardner Designs!, too. 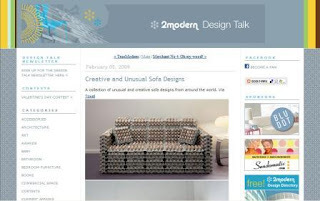 2Modern Design Talk will definitely take you on an excitingly fresh journey through contemporary design. Even if modern isn't your preferred design style, you'll be surprised by the relevance of the ideas showcased, and you never know when something might make sense for what you're trying to achieve. Photo courtesy of Yanko Design. Designer: Nguyen La Chanh. The notion of a 'living carpet' delights me to no end. Perhaps it's the science fiction lover in me thinking of Robert Heinlein's Stranger in a Strange Land [which I loved]. 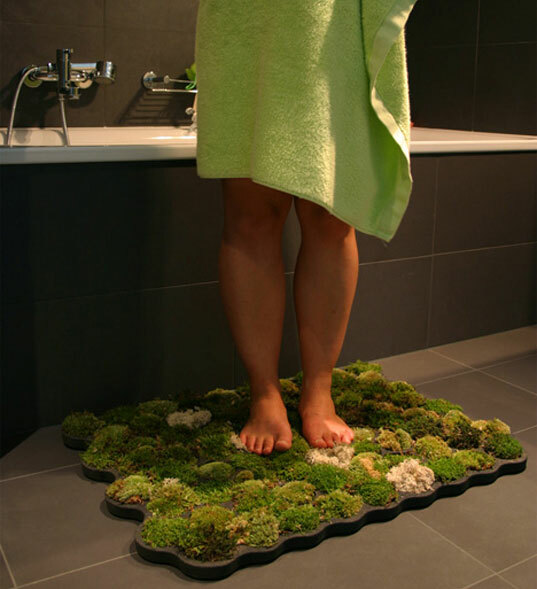 Imagine, then, how happy this story from Inhabitat about a living moss carpet for your bathroom made me! Designer Nguyen La Chanh created this Moss Carpet using plastazote, a decay-free foam, and combining three different types of moss - ball, island and forest - that thrive in humid environments like bathrooms. I can imagine the delightful springiness of the moss underfoot. It would definitely energize me for the day. Then, there's an indoor lush carpet of living plants in Idaho that also looks to soothe the soul and toes. I discovered it in Living Floor Like Heinlein's Grass Carpet: Science Fiction in the News. The living carpet not only feels good, but it helps to clean the air and cool the house [here's the relevant passage from Heinlein's story and a reference to Kurt Vonnegut's The Siren of Titan which I haven't read]. The plants also help humidify the air as the Seattle Times article on the story titled Home addition features a floor alive with plants describes. Serendipitously, as I can across these stories, I also realized that the header on my friend Daria Radota Rasmussen's blog Social Hallucinations captures a similar sensibility. Can you imagine anything more delicious than bare feet on [living] carpet? It certainly enhances the visual delight associated with a carpet of flowers [see Tapis de fleurs de Bruxelles and Brussels Flower Carpet 2008] by associating a tactile experience to the visual one. Methinks I'm ready for living carpet floors! Did you know that you can find Wear-Dated on Facebook? And, in no less than two different places. I decided instead to share care tips. With Elizabeth's help, we started posting carpet care tips. And, then, Shannon graciously offered to share non-carpet floor care tips, which we've interspersed in between carpet advice. Don’t forget to vacuum! Not only does vacuuming regularly maintain the appearance and condition of your carpet, but it also upholds your end of the warranty you have with your carpet manufacturer. Especially if you pinky swore. If a liquid spills on your carpet, soak as much of it up as possible with clean, white cloth, then remove what’s left of the stain using a mild solution of liquid detergent and water. Use a detergent that doesn’t contain lanolin or bleach. If you have hardwood flooring, you can and should vacuum every day to remove any harmful particles and maintain the floor’s appearance. When removing carpet stains, always blot, never scrub. The best way to prevent dirt from overtaking your carpet is to stop it from even entering your home. Place rugs at your doors to capture the extra dirt that tries to sneak in and consider taking off your shoes before stepping into the house. Your carpet (and your feet) will thank you. So you’re having a romantic evening for two when you suddenly realize that the candle has dripped all over your carpet. To remove the candle wax, spread brown paper or terry cloth over the area and iron it on ‘warm.’ The wax will be absorbed onto the paper or cloth. Voila! Regardless of the flooring you have in your home, use walk-off mats at all exterior entrances to prevent outside dirt, sand and grit from entering and harming your floors. To remove chewing gum from carpet, freeze the area with an ice cube, then shatter the gum with a knife handle. Vacuum, and continue on your merry way. If you consider them helpful, please do feel free to share them with others. And, if you're on Facebook, consider becoming a Friend of Wear-Dated. There are more tips coming and I'd love to see you.